I had been inactive in the children ministry for the past four years. When I give birth to our first son then after 18 months I was pregnant again to our second daughter, I couldn't commit and be directly involved in every children activities that we had. For these inactive years, I'm more of advising and looking for the needs to be done and help in small ways I can. In my heart I would have want to get hands on for these activities, yet I still chose to cater the needs of my children first, which is my main priority. If you will remember my last post about our children ministry last 2010, it was Dorothy who oversees our children ministry activities. 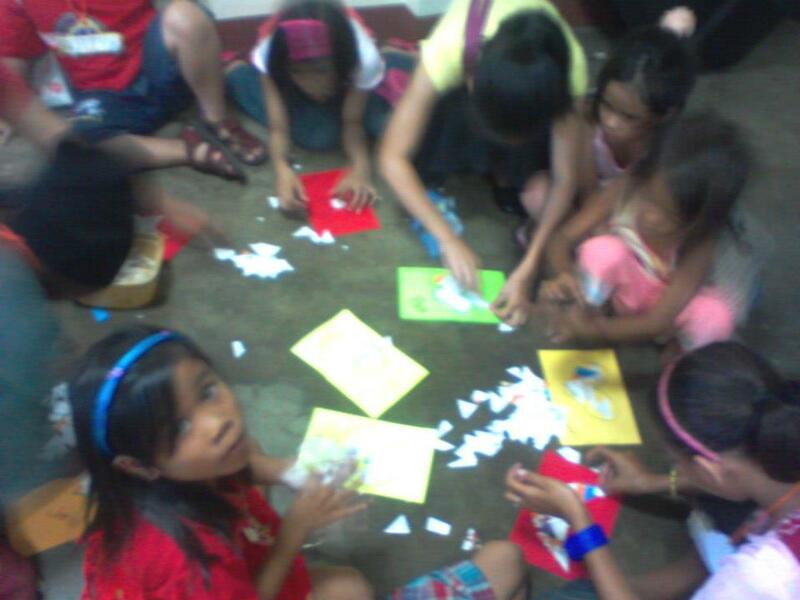 Dorothy needs to focus being the Child Evangelism Fellowship Area 2 Coordinator in Batangas, she needed to give up her ministry involvement in our church to aid children ministries of other churches. I gladly took over again her position without any hesitations if I can still manage it since this ministry is really close to my heart. I couldn't wholly express how burdened I am for the children. Leading this ministry in the church for the second time is a way different compared before. The load is lighter because my former students are now part of our teaching staff in our children's ministry. After every event, the team meets and discuss of how to improve the program. Everyone shares and collaborates their ideas for effective ministry. We all share the same passion of directing these little ones to the love of God. I know how much they are praying for the children that we regularly invite in the church during our Celebration Sundays which is held every last Sunday of the month. We hope and pray that God will work on their lives. Instead of teaching Bible Stories with visuals (a usual way) and split them into groups, we made scripts for role playing. For our first attempt, the theme was about the fruit of the Holy Spirit. We find it more effective and decided to continue using this method. We have been working for these children for 8 months now. We encountered problems handling them. We could hardly control the children during class some of them would fight and beat co-children, a sudden loud cry in the middle of the Bible story, some will regularly stand in seat just to distract other children's attention and more similar difficulties. In our assessment, the children are now trying to keep good behavior during our programs. The changes we applied also helped us to completely reach and effectively teach them. The children that we are reaching are hard to deal with because most of them grow in the street. Their parents were incapable of guiding their children the biblical way. We know these children because we regularly see them in the market and how other people treat them. Most of the people we know would say negative reactions about their behavior. We were able to talk to individuals that even the market securities are tired of controlling the misbehavior of these children. Just to share, when we haven't started this ministry, some of these children would steal bread and other items that they can easily get from our store. Now they became our friends and we'll hear them greeting us whenever they'll see us in the market as a sign of their respect and gratitude. We do sacrifice our comfort for the sake of teaching these children whom others consider them to be not so special. We often ignore their needs, push them away, easily raise our voice and hurt them when they tricked us (a very common scenario in the market place). They grow up in a very hostile environment. They do know how to love and be loved. They needed someone to reach for them and made them feel special. This is what Jesus showed his disciples when he said, "Let the little children come to me."